The football player, the winemaker and a cellar rat. Their friendship was instantaneous, and based on a deep admiration for each others’ talents. 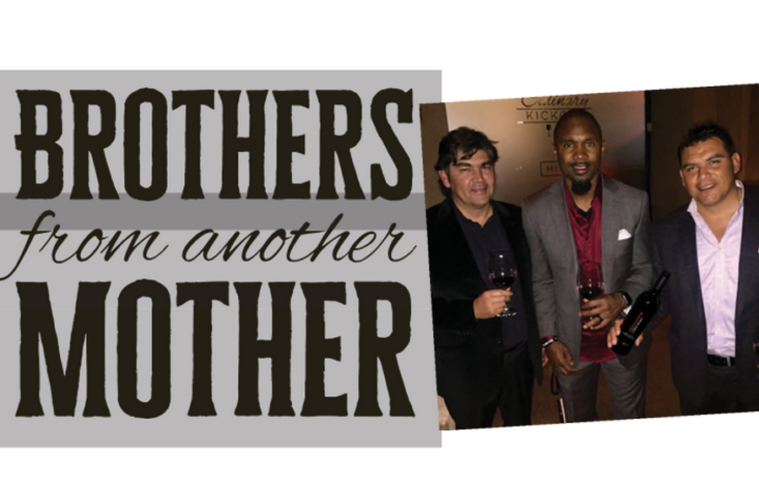 While winemaker, Gustavo Gonzalez envied the athletic prowess of NFL powerhouse Charles Woodson, Woodson in turn respected the viticultural mastery of Gonzalez and Rick Ruiz. And thus, a friendship was formed. The trio met nearly 20 years ago when Woodson trained with the Oakland Raiders in Napa. Ruiz noticed Woodson in a restaurant drinking one of his wines, and he introduced himself as the cellar rat. A friendly chat resulted in a mini wine seminar with Ruiz introducing the Merlot-wedded Woodson to additional varietals. 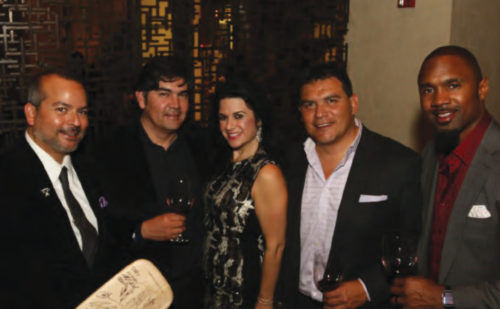 After Ruiz and Woodson’s restaurant meet-up, Ruiz invited the NFL star to his then place of work – Robert Mondavi Winery. 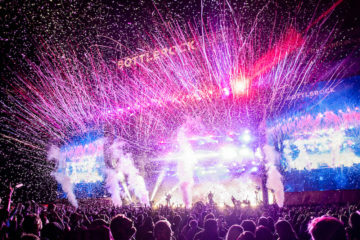 Soon after that effort, they formed a partnership and started creating wines together on a commercial basis. The first official vintage was a 2005 Cabernet Sauvignon. 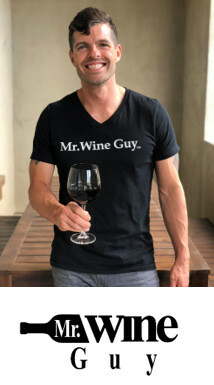 It was at this time that Woodson, was lured from the Bay Area with the Green Bay Packers contract, but the duo continued their joint winemaking. “Because of Charles’ popularity, our wine was instantly embraced by Green Bay residents who bought most of our production during the first couple of years,” said Ruiz who reminisces fondly about his ties to the Badger state. There were many memorable moments, but one in particular stood out. Woodson return to the Raiders in 2012. He and Ruiz opened Cult Wine Following in Downtown Napa showcas- ing Charles Woodson Wines, but after the 2014 Napaquake, their building was heavily damaged and they were forced to move. Today, the two own and operate Tasting Room 24, named for Woodson’s NFL jersey num- ber with the Raiders. Located in the Crusher District at Napa Valley Corporate Park, it’s one of the most unconventional wine tasting rooms in the valley. 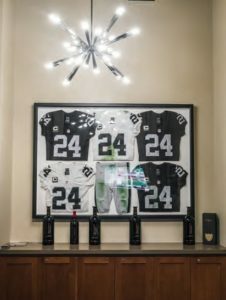 Part sports bar, part fine wine emporium, Tasting Room 24 is – in honor of Woodson’s career – a certified Green Bay Packer, Raider, and University of Michigan Football bar where fans of those teams easily find camaraderie. And like any great sports bar, they showcase other sports and teams as well. The 4,000-square foot tasting room (available for buy- outs and private events) features a central H-shaped bar allowing guests to sit in a circle and converse, commiserate, and cheer together. The H represents the Heisman trophy Woodson won in 1997 while at Michigan. Six large televisions mean six different games can be viewed at the same time. An additional lounge area emulating Woodson’s home living room is equipped with big comfy chairs and is a comfortable spot in which to relax. 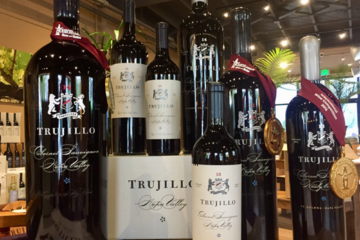 Throughout Woodson’s NFL career with the Raiders and Packers, he and Ruiz continued to make wine together. They started in 2005 with 150 cases and are now up to 3000 cases. The Charles Woodson label includes Cabernet Sauvignon and Sauvignon Blanc with plans to expand to 10,000 cases and three more varietals in 2019. 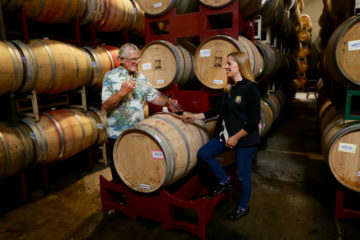 Also new is their barrel tasting facility located within football-throwing distance to their tasting room, where wine connoisseurs, neophyte wine drinkers, and sports fans can enjoy tasting flights and barrel tastings. Relaxation is a concept that Woodson welcomes. After a star-studded career in American Football that spanned more than three decades, Woodson’s acco- lades and accomplishments are numerous. He led the Michigan Wolverines to a national championship in 1997 where he played both offense and defense. He was selected as the NFL Defensive Rookie of the Year in 1998 by the Associated Press. He was named to the Pro Bowl and earned All-Pro recognition three consecutive times. He was the AP NFL Defensive Player of the Year for the 2009 NFL season, and he is one of the few players in NFL history to play in a Pro Bowl in three different decades (1990s, 2000s, 2010s). He is currently tied for fifth on the all-time interceptions list with 65. In 2015, he announced his retirement from the NFL and signed with ESPN as a sports commentator. 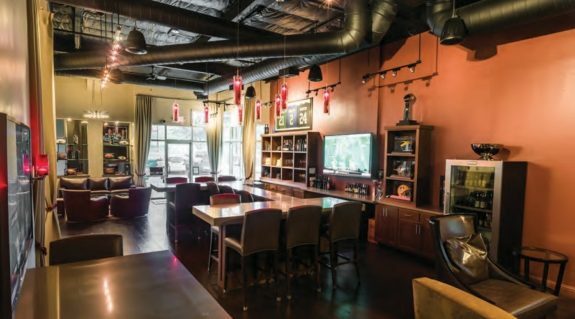 Tasting Room 24 is filled with Charles Woodson memorabilia for his fans to enjoy. 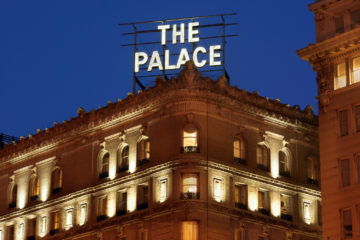 “Charles is a blessed man and he’s passed those blessings to me and now I can pass them to our staff – the best staff in the Napa Valley,” said Ruiz. People come here because of our staff, many of whom have been with us since the beginning. 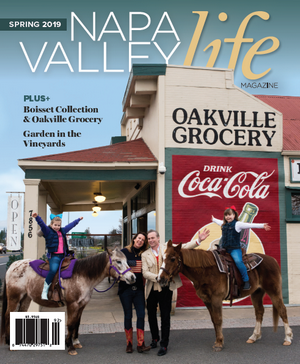 No place in the Napa Valley is doing what we are doing. We are a sports bar that serves beer, wine and bubbles, and delicious food on Sundays. Because of our great gateway location, guest can start or end their wine tasting experience at Tasting Room 24. Being on the south edge of town we are the first or last tasting room you will see.” And if you wonder how many varieties of beer, wine, and bubbles are served at Tasting Room 24, the answer is in the name, and on Woodson’s jersey. It’s 24 of each, of course.